Rob enjoyed great acclaim in Europe & returned from his tours of Norway, Switzerland & Germany to Canada. 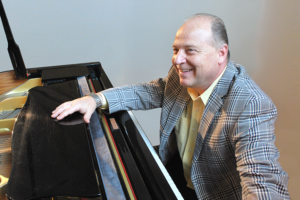 An accomplished pianist, Rob Reed has done it all, from sold-out concert halls, to intimate piano performances, lounges, 5 star international hotels, nightclubs, bistros, pubs, roadhouses & exclusive supper clubs & Corporate buildings. This could be, Rob Reed’s finest hour, as he rides high on the momentum he generated throughout his successful 80’s and 90’s recording career. Recently, he added a 5th-album to his discography & has hosted a piano room to overjoyed regulars for years now. With over 8,000 songs in all styles at his fingertips, seldom do any requests go unmet. His inviting nature, extensive repertoire, & commanding voice have earned him the respect & admiration of fans & peers from Scandinavia to the South Pacific as well as across Canada. From black tie affairs & corporate events to casual afternoon patio socials, “Mr. Versatility”, has an informal and accommodating style that lets you savor Rob Reed’s talent time & time again. He’s an international caliber performer & recording artist, with albums & radio charted singles that have been heard worldwide. Say hello, dance, request your favorite tunes, sing along, or just relax & enjoy the music, ambiance & talents of Mr. Rob Reed.